We introduced you to the Byland’s beautiful house on Wednesday, but intentionally left out some of the best spaces of the house to ensure your return! 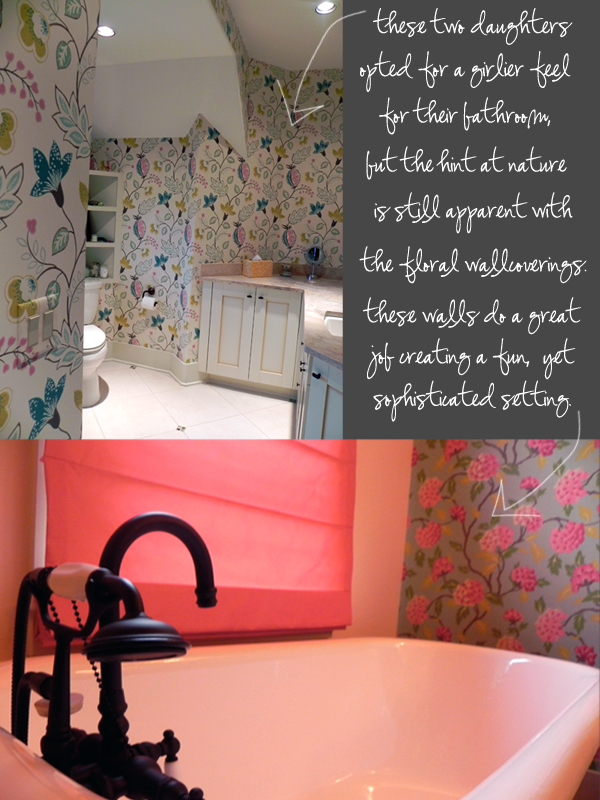 Starting with the Powder Room, it is located right off the entrance and has a truly distinctive style. 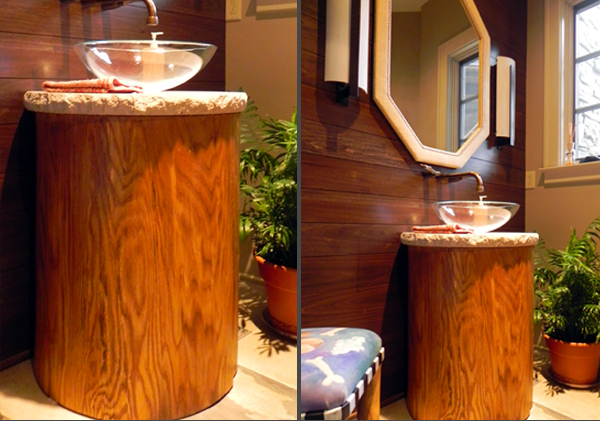 In keeping with the natural yet elegant ambiance of the house, we paired a tree stump with a stone top to create the vanity. 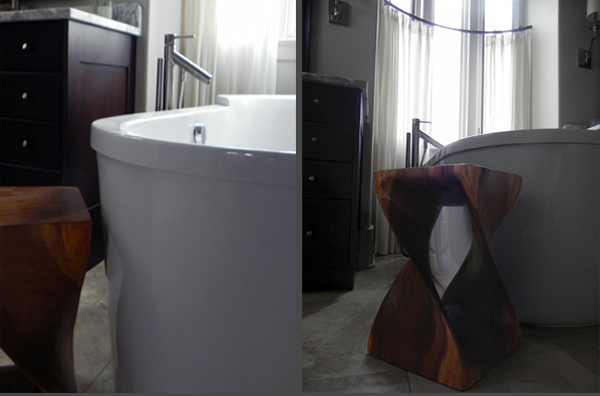 Then to bring in a graceful element we added a modern glass sink and a linen upholstered octagon mirror. The painted side chair placed in the space adds a touch of fun! Next, we have the girl’s bathrooms, and as promised they are equally as unique as the girls who live in them. While the first one is subtle yet lovely with a pop of color, the second two go much bolder with their color pallete. Each has a feminine and youthful sense to the space. 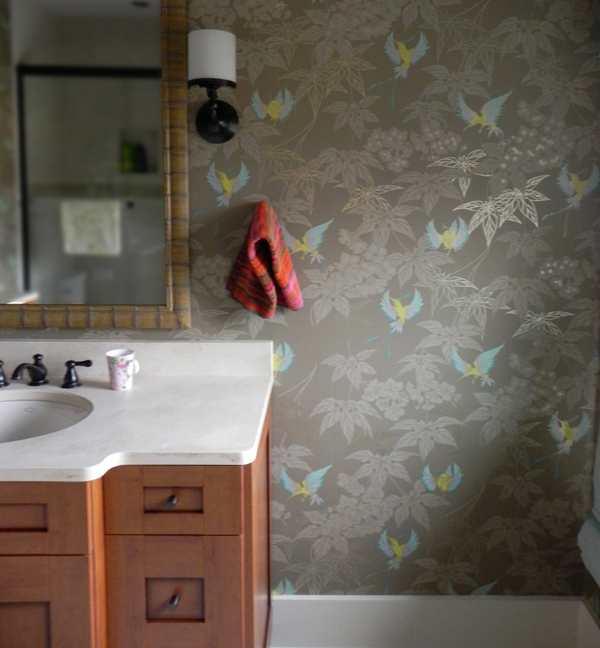 Last, but definitely not least, is the master bath. This room is the epitome of elegance with a crisp white porcelain tub and soft sheers to allow the natural light to flow in. A calmness embodies the room with it’s rich stained cabinets and they are the perfect contrast to balance the other feminine touches in the room. The polished nickel finish on the sconces and hardware adds sophistication, while the full length window is a great source of natural light. 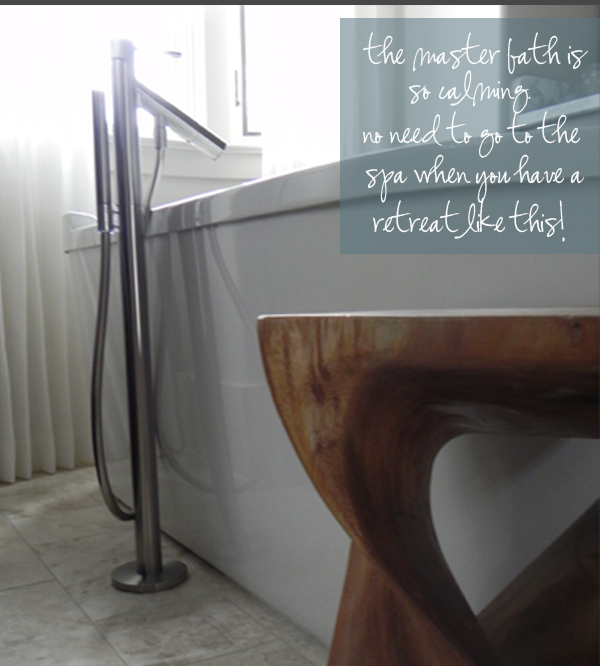 Together the combinations of these elements create a space that embodies relaxation. We hope this post gives you inspiration on how to combine your appreciation for the outdoors with your elegant taste. It’s not as hard as it sounds anymore, is it? Even the most rustic pieces can be sophisticated when used correctly! The juxtaposition of the organic, earthy elements in this home with the modern, clean design makes the home so special! Many thanks to the Byland family for allowing us this peek inside their wonderful new home. We hope you enjoyed your tour!